In this edition of Meet the Gear, Sherman Tam chats with Alan Goldman, an adjunct research associate and industry liason at the S3D Centre, about the rise of point and shoot 3D and what they bring to the industry of stereoscopic 3D production. First of all, what is it that sets 3D point and shoot solutions apart from more traditional, industry-standard offerings? 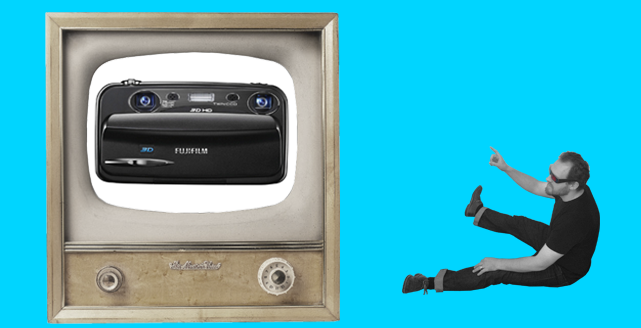 Point and shoot cameras in 3D is a recent phenomenon. Advances in digital technology has allowed image synchronization, which is key in producing stereoscopic 3D imagery, to happen within the camera itself. Traditionally, 3D images were captured on either rigs that synchronized two individual cameras, or on beam splitter devices. These solutions were and still are widely used in professional shoots. Point and shoot cameras, however, have both simplified the creation of 3D images and lowered the entry cost for average consumers seeking to produce 3D content. Since point and shoot 3D is relatively new, what sort of presence do they have on the 3D production market? What does the market for point and shoot look like right now? Right now, FujiFilm, Sony, JVC, Panasonic and GoPro (Canon is also showing interest in entering the market) are amongst the main players in entry level point and shoot 3D, and each manufacturer to certain extents have geared their products to meet specific demands in the entry level market. For instance, FujiFilm point and shoots such as the W1 and the W3, while capable of taking video, are great for taking still 3D photos. 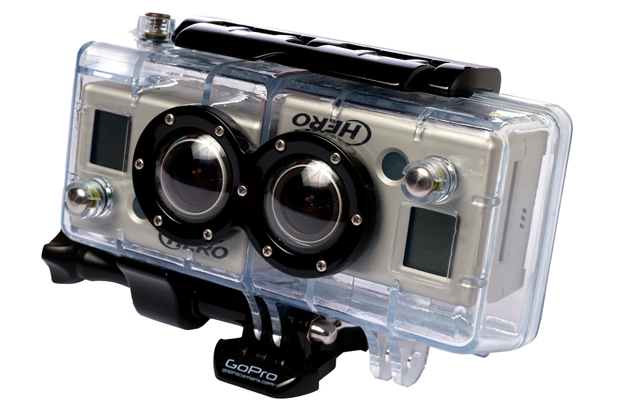 The GoPro Hero system which uses two cameras stands out in capturing motion, such as extreme sports and the like. Sony, JVC and Panasonic have offerings that are more powerful in terms of taking 3D videos, but are also pricier as well. These companies have taken the leap from the consumer market to a prosumer market, and point and shoots in this segment can range from $2,000 for lower end models to upwards of $30,000 for the high end solutions. An issue that emerged from having so many players in this market is that different manufacturers use different codecs for their camera outputs. For example, if I shot something with a Sony camera, I can only edit the footage in Sony software. Footage shot from a Panasonic camera will use a different codec, but may be more universal. There are workarounds for dealing with some of the codecs, but it’s unfortunate that filmmakers have to figure out how to work with all these different codecs and proprietary software. Some of the more powerful software such as Final Cut Pro and Avid do read a lot of codecs, but I’m not sure if there’s one that reads every codec. 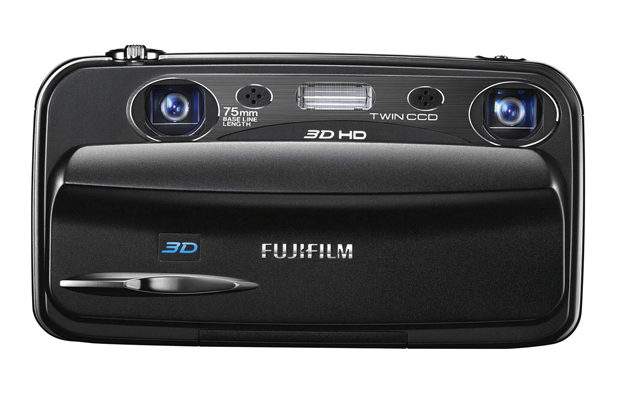 The FujiFIlm Finepix Real 3D W3. What are some of the drawbacks of point and shoot 3D? Point and shoot solutions may be comparatively inexpensive and easier to use, but they do not offer the same flexibility as the more expensive and comprehensive professional solutions. For fixed-width point and shoots like the FujiFilm cameras, where the two lenses or “eyes” are in fixed positions on the camera body, the obvious downside is the fixed interaxial distance. This forces you to learn to position your body in relation to the subject. Other downsides include lower image quality due to a less powerful image sensor, and less options to change factors such as bitrate and polarization. Is point and shoot 3D, despite the downsides, still a good way to get into the world of stereoscopic 3D? Definitely. A FujiFilm point and shoot costs between $400 to $500, and all you really need is that one camera to start producing 3D content. One of the great things about point and shoot 3D is that sense of instant gratification; you take the image and you can view it on the back of your camera immediately afterwards. The limitations of point and shoots can also be beneficial. I mentioned earlier that one of the drawbacks of fixed-width point and shoot cameras is that you have to be very aware of your body positioning because of the fixed interaxial distance. For me, it was extremely useful as I got to see and understand 3D compositionally and I can translate that into body position, which I think is really important for people working with 3D photography. For the more patient and technologically proficient, building your own rig with two regular cameras can also be a way to start producing 3D content. The tricky part is syncing the two cameras. Sean Arden at the S3D Centre had his first 3D experimentation with a custom rig, and building your own rig is a great way to learn 3D. The GoPro 3D Hero System. Point and shoot 3D has made its mark on the market, so where does it go from here? So far, point and shoots haven’t made that big of an impact in the professional market. The GoPro systems do see some use; the footage from those systems are being intercut with other footage. Prosumer cameras like Sony’s are making headways into professional shoots, but prosumer solutions can probably make up 20% to 30% of a professional shoot and the rest will need to be shot with professional-grade cameras. I would say that the two main camps in professional 3D production are beam splitter cameras and single camera solutions, but I think fixed-width cameras like the point and shoots we talked about may play an interesting role as they get more powerful and go down in price.